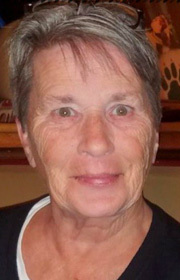 STRATFORD — Donna Mae Will­iams, 66, of Strat­ford, died on Wed­nes­day, Oct­ober 10, 2018, at Mercy Medical Center, in Des Moines. The family will receive friends and relatives on Saturday, October 20, 2018, at Boman Funeral Home from 10:00 – 11:00 a.m. followed immediately with a memorial service at 11:00 a.m., at the funeral home. Donna was born on July 21, 1952, to Oscar and Dorothy (Barber) Williams, in Fort Dodge, Iowa. She married David Choate, Sr. on June 11, 1969, in Boone, Iowa. The couple had two children together and were divorced after 17 years of marriage. She had an extensive frog collection, enjoyed attending races at the Boone Speedway, and her favorite treat was a chocolate shake. The thing Donna loved most was her children and grandkids, they were her life. Donna’s family included: her son David “Scooter” (Rose) Choate, Jr. of Webster City; daughter Becky Kiesecker (Dave Morse) of Webster City; three sisters: Georgia (Frank) Perkovich of Boone, CeCe Paris of Boone and Teresa (Tim) O’Brion of Milford; eight grandchildren: Kierstin Henry, Chelsey Arias, Michaelia Forbush, Michael Henry, Jr., Quentin Henry, Aycelyn Kiesecker, Shelby Choate, and Josi Hines; five great-grand children; two grand-dogs and three grand-cats. She was preceded in death by: her parents; sister Buckey Williams and brother Tom Williams.